Medical schools in North Carolina have consistently ranked top in primary care for years. It is also no coincidence that nearly 14% of all medical students from North Carolina choose family medicine as their specialty. For instance, University of North Carolina Chapel Hill School of Medicine ranked first for primary care in 2017 followed by other highly ranked medical schools in the country such as University of Washington, UC San Francisco, and Baylor College of Medicine. Just how hard is it to get through the admissions process in North Carolina? Although it is fairly competitive, you’ll have a significant advantage if you apply as an in state student. For instance, Brody School of Medicine at East Carolina University accepts 100% of students from within the state. Similarly, the University of North Carolina at Chapel Hill School of Medicine interviews nearly half of its in-state applicants compared to a 2.6% out-of-state interview rate. On the other hand, if you have a substantial research background, along with a highly competitive GPA and MCAT score, Duke University School of Medicine might be an excellent choice considering that they interview out-of-state applicants at a higher rate compared to other schools. Currently, Duke University School of Medicine ranks within the top fifteen best research medical schools in the nation and second in surgical residency as reported by US News and Report. 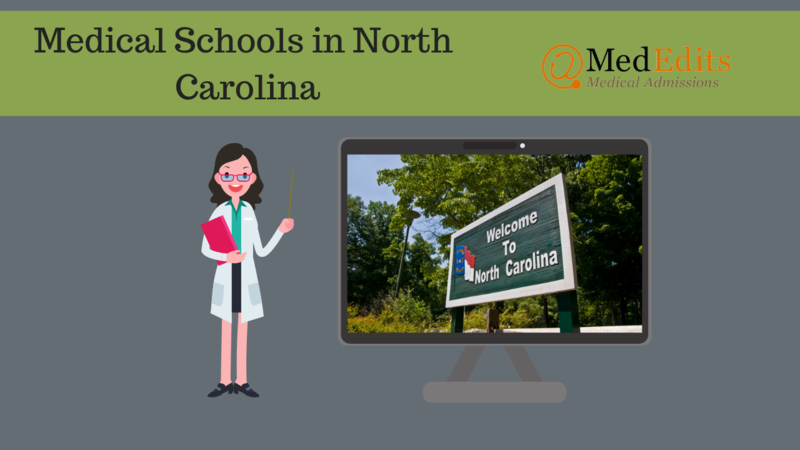 Considering applying to medical schools in North Carolina? Sign up for a FREE 15 minute advising session with an admissions expert. To understand better let us list all of the medical schools in North Carolina. Initial findings from each North Carolina medical school suggest that most matriculants have done some sort of clinically related work. For example, Brody School of Medicine at East Carolina University lists that nearly 80% of their accepted students volunteered at a hospital or clinic and 90% of them shadowed a physician. Likewise, Duke University School of Medicine and the University of North Carolina at Chapel Hill School of Medicine listed that 85% of their accepted students volunteered and 85% of them shadowed a physician. Now it should be no surprise that medical schools in North Carolina prefer applicants who’ve gained some sort of clinical experience in the past. Keep in mind that most applicants will apply with competitive GPA and MCAT scores but what could set you apart from the rest of the applicants could be your clinical experience. In fact, working in a clinical setting as a scribe or a medical assistant can be distinguishing. North Carolina medical schools value a commitment to serve to local communities. Therefore, a demonstrated commitment to community service can set you apart in the application process. To further strengthen your “readiness,” research experience serves a vital part of your candidacy to these schools. On average, 86% of North Carolina medical school applicants completed some sort of research and lab work in the past. To measure how competitive it is to get into a medical school in North Carolina let’s take a look at some of the numerical data for each medical school. Below are the averages of MCAT scores, GPAs, interview rates of in-state and out-of-state applicants, acceptance rates, matriculants of in-state and out-of-state, and cost of tuition for each medical school. With more than 26,000 applications received in 2018-2019 to North Carolina medical schools and an average acceptance rate of about 5.6%, it is clear the competition is difficult. So, what are some steps you can take to improve your chances through admissions? Though admissions committee favor students who’ve done research, strong extracurricular experiences, and excelled in all of their major and science classes with top-notch standardized test scores, North Carolina is a state that favors clinical work and community service. So, how can you gain experience in research and clinical volunteering before applying to medical schools? One way to do so is to reach out to local hospitals and clinics around your community. By simply picking up a cell phone or sending out few e-mails to volunteer offices or doctors’ offices, you can improve your chances rather than submitting a single application and waiting to hear back from them. If you are taking a gap year, consider working in a clinical setting full time. Similarly, scouting for laboratories around your area, schools, and hospitals can be very beneficial. If you’re a student who lacks clinical/volunteer/research hours, it may be astute to take a gap year or two to focus extensively on these areas. Not only will this build your resume in the long run, but you can demonstrate your maturity, personal growth, and service to your local community which admissions committee really look for during interviews. It could also fuel your secondary application essays when explaining why medicine is the right path for you and what you’ve learned through interacting with patients in your community.